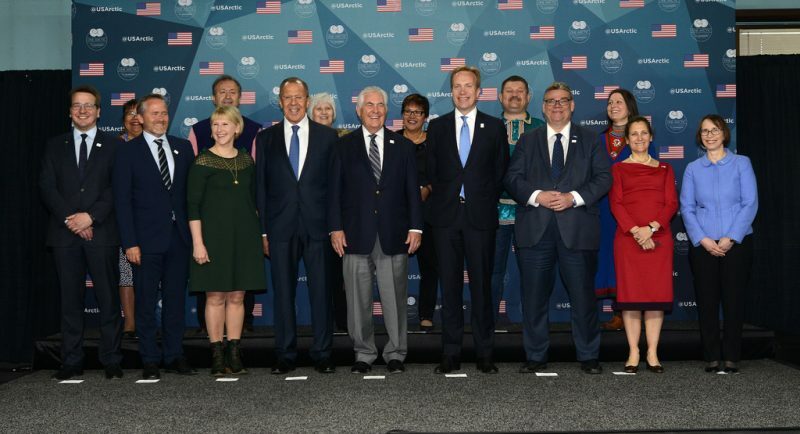 Secretary Tillerson Poses for a Family Photo With Principal Participants and Heads of Delegation at the 10th Arctic Council Ministerial Meeting in Fairbanks. Photo via US Department of State. On May 10, Russian Foreign Minister Sergey Lavrov stopped in Washington on his way to the Arctic Council’s meeting in Fairbanks, Alaska, to meet with United States Secretary of State Rex Tillerson. By the end of the weekend, the Trump Administration found itself immersed in turmoil over the classified intelligence President Donald Trump spilled to Lavrov during the visit. It was an unusually political start to the Arctic Council’s biennial Ministerial Meeting in Fairbanks on May 11. At the meeting, the United States wrapped up its two-year turn as chair and handed the reins to Finland. The meeting is a gathering of the foreign ministers of Canada, Denmark, Finland, Iceland, Norway, Russia, Sweden and the United States, as well as representatives from six Indigenous peoples’ organizations, to discuss Arctic issues. This meeting was one of the most significant in the Council’s history, as states took action that will strengthen the institution. First, the Council re-committed to the environment, a niche in which it can have success. Second, states once again used the Council as a policy-making body, a potentially powerful tool at the institution’s disposal. Third, the Council took action to increase the number of voices around the table, which will allow for greater international engagement. Fourth, Russia and the United States signalled a willingness to work with the Council, a huge question mark heading into the meeting. First off, this meeting saw the Arctic Council enhance its focus on environmental issues and climate change. States formed the Council in 1996 to complete co-operative projects on environmental issues and sustainable development. As I have argued elsewhere, the Council has devoted an increasing number of resources since 2010 to projects designed to enhance the economic prospects of the Arctic region. During Canada’s recent turn as chair, from 2013 until 2015, about one-quarter of the Council’s work concerned economic issues, such as guidelines on oil and gas development. As the United States assumed Council leadership, some commentators believed the new chair would complete more environmental work, as the Obama Administration had a strong interest in taking action on climate change. At the 2017 Ministerial Meeting, we learned the Council completed the same number of economic projects as was completed during Canada’s chair (23, depending on how one counts). However, the overall number of projects undertaken by the Council increased (101, from 84), meaning that the proportion of economic projects fell to under one-quarter. Thus, it is clear the Council renewed its commitment to the environment at the most recent Ministerial Meeting. In addition, many of the Council’s economic projects have a strong environmental element. For example, the Council has undertaken a number of projects to deal with oil spills. Though these projects create infrastructure that could make the region safer for energy development, preventing oil spills helps the environment. Another ongoing Council project, the Arctic Marine Shipping Assessment, outlines the current state of Arctic shipping, but contains significant information on pollution. A focus on environmental issues makes sense for the Council. Its mandate is environmental in nature and the majority of its work is on the Arctic ecosystem. A renewed focus on the environment is the niche the Council should fill, which will ultimately result in a more successful institution. The second step taken by the Council at the recent meeting is a new willingness by states to use the Council as a venue to create binding international policy. Until 2009, the Council was not a place to create treaties; rather, the institution created action plans and issued policy recommendations. Between 2009 and 2011, states created an agreement in the Council on search and rescue, followed by another between 2011 and 2013 on response to oil spills. There were no Council agreements between 2013 and 2015 (though it did create two “non-binding” agreements). This time around, foreign ministers signed a new agreement on scientific co-operation in the Arctic. The policy is not overly ambitious (as is the case with earlier Council agreements). States pledge to give foreign scientists access to their territory for scientific purposes, as well as “platforms, material, samples, data and equipment.” David Bolton, Deputy Assistant Secretary of the U.S. Bureau of Oceans and International Environmental and Scientific Affairs, said in a briefing, “There have been times in the past when permissions that scientists seek to do scientific research in another country have not been granted or not been granted as readily as need be.” This agreement makes the Council stronger. Any institution that can be a venue to create binding, formal policy will be stronger than an institution that creates recommendations states can ignore if leaders wish. The Council took action in Fairbanks to strengthen the voices of non-Arctic states and non-state actors. The Indigenous peoples’ organizations announced the establishment of the Álgu Fund, which aims to raise $30 million to help Indigenous peoples participate in Arctic governance activities. The new scientific co-operation agreement encourages researchers “to utilize, as appropriate, traditional and local knowledge.” It stops short of requiring the use of traditional knowledge, but could lead to a greater number of scientific researchers inviting Indigenous peoples to share their expertise. Beyond that, the Council accepted seven new accredited observers, bringing the total to 39. Observer states and organizations have the right to attend Council meetings, but they are not full members. International engagement and an enhanced voice for Indigenous peoples can strengthen the institution. A positive development for the Council’s future is that Russia signalled it is willing to work with states in the Council, though tensions remain. There was some speculation that Russia’s Foreign Minister, Sergey Lavrov, would skip the meeting, given recent tensions and the fact that Donald Trump’s administration is under investigation for its ties to Russia. Lavrov skipped the 2015 Ministerial Meeting in Canada due to tensions with the West. Russia’s Arctic policy continues to be controversial, as it faces criticism for its treatment of Indigenous peoples and possible interference in the most recent elections of the Russian Association of Indigenous Peoples of the North. Not only did Lavrov attend the meeting, he met with President Trump and Secretary of State Tillerson in Washington the day before, an event that has generated no end of controversy amid the revelation that Trump gave Lavrov classified information during the meeting. Still, the fact that Russia showed up willing to talk is significant. The United States also signalled the new Trump Administration has an interest in the Council’s environmental work. The Associated Press said that there was speculation that Tillerson would use the Arctic Council meeting to announce the United States’ withdrawal from the Paris Agreement (the most important international treaty on global warming). Instead, the United States signed onto the Fairbanks Declaration, along with all of the Council states, a document that expresses support for international action on climate change. It says that states are “noting the entry into force of the Paris Agreement on climate change and its implementation, and reiterating the need for global action to reduce both long-lived greenhouse gases and short-lived climate pollutants.” Some media said that the declaration is a treaty, which is untrue; the declaration is non-binding. At the least, many media outlets took the support of the Fairbanks Declaration as a surprise. Tillerson made it clear that signing the declaration does not mean the new administration will implement the Paris Agreement. “We’re not going to rush to make a decision,” he said at the meeting. “We’re going to work to make the right decision for the United States. The Arctic Council will continue to be an important platform as we deliberate on these issues.” He also said it is important to make “sure that we continue to be vigilant in protecting the fragile environment.” Tillerson expressed support for the Council in an official statement, saying, “I want to affirm that the United States will continue to be an active member in this Council.” Inside Climate News, a climate change news site, reported that the U.S. demanded language in the agreement be watered down, leaving some Council representatives disappointed. Yet, the fact that the U.S. accepted the language it did is significant. It demonstrates the strength of the Council that even the Trump Administration vows to co-operate in the venue. The Arctic Council is stronger after its most recent meeting. There is much to criticize about the Council and reasons to be pessimistic. We can debate whether the environmental work of the Council is serious, or anything that will see implementation. We can point out that policy-making is still a small part of the Council’s work. There is much to criticize in terms of the support the Council gives to Indigenous peoples and whether their voices are truly heard. The way the Council deals with new observers is not without fault as several states and organizations had their request for observer status denied. Russia’s actions are promising, but warrant suspicion given its recent conduct on the world stage. The United States says it supports environmental action, but its actions will ultimately speak louder than its words. Given the unpredictability of Trump, anything is possible in terms of his administration’s relationship with the Arctic Council. Yet, optimism can override pessimism in this case. The Council has a renewed focus on the environment and policy-making. It is admitting new observers and there is reason to hope Indigenous peoples will have a greater voice. Russia and the United States both seem dedicated to the Council. With unpredictability on the world stage, the Council seems stable and ready to grow. See: Arctic Council, Annex 2, Iqaluit 2015 SAO Report to Ministers, Amarok: Arctic Council Tracker (AAC), Iqaluit, 24 April 2015 (Tromsø, Norway: Arctic Council, 2015). For example, see Sneh Duggal, “U.S. Appears Set to Differ Arctic Council Agenda from Canada,” The Embassy, November 5, 2014, http://www.embassynews.ca/news/2014/11/05/us-appears-set-to-differ-arctic-council-agenda-from-canada/46341/?mlc=604&muid=23042. See: Arctic Council, Amarok: The Arctic Councl Tracking Tool Maxi-Report (Fairbanks: 10th Arctic Council Ministerial Meeting, 2017). Arctic Council, Agreement on Enhancing International Arctic Scientific Co-operation, May 11, 2017, Article 4 and 5. Available: file:///C:/Users/Andy/Downloads/EDOCS-4288-v2ACMMUS10_FAIRBANKS_2017_Agreement_on_Enhancing_International_Arctic_Scientific_Cooperation%20(1).pdf. State Department, “Briefing on the Arctic Council Ministerial,” May 8, 2017, https://www.state.gov/r/pa/prs/ps/2017/05/270728.htm. Atle Staalesen, “Establishment of a $30 Million Álgu Fund Marks New Beginning in Arctic Council, Indigenous Peoples Say,” Barents Observer, May 12, 2017, https://thebarentsobserver.com/en/life-and-public/2017/05/establishment-30-million-algu-fund-marks-new-beginning-arctic-council. Agreement on Enhancing International Arctic Scientific Co-operation, Article 9. For example, Sputnik International. “Decision on Lavrov’s Participation in Alaska Arctic Council Not Made Yet,” April 20, 2017, https://sputniknews.com/politics/201704131052614793-lavrov-alaska-arctic-council/. Heather Exner-Pirot, “The Canadian Arctic Council Ministerial – What to Expect,” Eye on the Arctic, April 15, 2015, http://www.rcinet.ca/eye-on-the-arctic/2015/04/15/the-canadian-arctic-council-ministerial-what-to-expect/ (accessed May 26, 2015). See: John Thompson, “The Delicate Subject in Northern Russia of Indigenous Rights,” Arctic Deeply, April 11, 2017, https://www.newsdeeply.com/arctic/articles/2017/04/11/the-delicate-subject-in-northern-russia-of-indigenous-rights-2. Greg Miller and Greg Jaffe, “Trump Revealed Highly Classified Information to Russian Foreign Minister and Ambassador,” Washington Post, May 15, 2017, https://www.washingtonpost.com/world/national-security/trump-revealed-highly-classified-information-to-russian-foreign-minister-and-ambassador/2017/05/15/530c172a-3960-11e7-9e48-c4f199710b69_story.html?hpid=hp_hp-banner-main_trumpintel-0504pm%3Ahomepage%2Fstory&utm_term=.1c711d524eba. Mark Thiessen, “Tillerson Says United States Won’t Be Rushed On Climate Change Policies.” Associated Press, May 11, 2017, http://m.startribune.com/officials-from-arctic-nations-meet-amid-drilling-concerns/421956893/?section=nation. Arctic Council, Fairbanks Declaration 2017, 1. Sputnik International, “U.S. Ends Arctic Council Chairmanship by Signing Treaty on Carbon Emissions,” May 13, 2017, https://sputniknews.com/environment/201705131053567899-usa-artctic-council-chairmanship/. For example, Peter Wijnen, “A Victory for the Climate in the Arctic Council, According to Sweden – U.S. Signs a Non-Binding Statement,” Norway Today, May 12, 2017, http://norwaytoday.info/ukategorisert/climate-progress-arctic-council-sweden/; Conor Finnegan, “U.S. Signs International Declaration on Climate Change Despite Trump’s Past Statements,” ABC News, May 11, 2017, http://abcnews.go.com/Politics/us-signs-multilateral-declaration-climate-change-trumps-past/story?id=47357120; Radio Free Europe, “U.S. Joins Arctic Council in Calling For Action to Curb Climate Change,” May 12, 2017, https://www.rferl.org/a/us-joins-arctic-council-calling-for-action-curb-climate-change-despite-white-house-skepticism/28481689.html. Rex Tillerson, “Remarks at the Arctic Council Ministerial Meeting,” U.S. Department of State, May 11, 2017, https://www.state.gov/secretary/remarks/2017/05/270813.htm. Arctic Council, “Arctic Council Ministers Meet, Sign Binding Agreement on Scientific Co-operation, Pass Chairmanship from U.S. to Finland,” Press Release, May 11, 2017. Dr Andrew Chater serves as Expert in Arctic Governance and International Decision Making. He is also a professor in political science at Brescia University College in London, Ontario. He completed his doctorate at the University of Western Ontario and was previously a graduate resident at the Rotman Institute of Philosophy. He holds a master’s degree from the University of Waterloo. His research interests include Arctic governance, geopolitics and security, as well as Canadian foreign policy. His dissertation, Explaining the Evolution of the Arctic Council, examines reasons for contemporary changes in the role of the Arctic Council. It was completed in 2015. In 2013, he was part of the Arctic Athabaskan Council’s delegation at Arctic Council meetings in Whitehorse, Yukon.